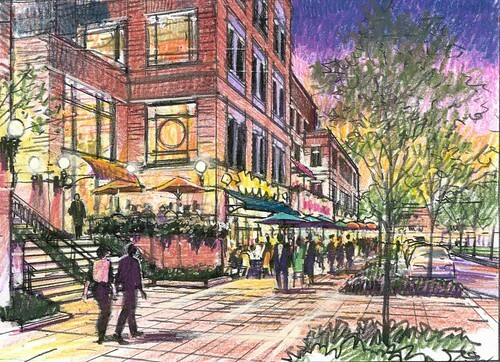 2004 vision of a redeveloped downtown Wheaton. Unhappy with getting a smaller slice of downtown Wheaton than they originally hoped for, developer B.F. Saul has pulled out of the county's redevelopment scheme for the area. Residents impatient for new investment will be frustrated, but Wheaton's revival is already underway, and it'll continue with or without B.F. Saul. 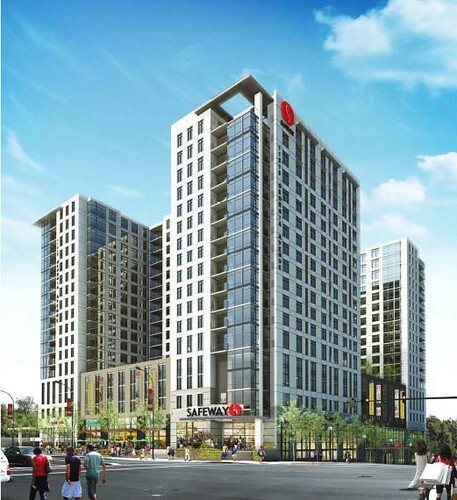 Two years ago, County Executive Ike Leggett made an agreement with the Bethesda-based firm to redevelop several county-owned parcels in Wheaton's languishing downtown with apartments, shops, government offices and a hotel, along with a town square. The project would have over a million square feet of new development and be paid for with a mix of public and private funds. Leggett and B.F. Saul hoped the project would give Wheaton a shot in the arm, bolstering local businesses while attracting additional development to the area. Though the project had a lot of community were supportive, the County Council balked at its size and cost. 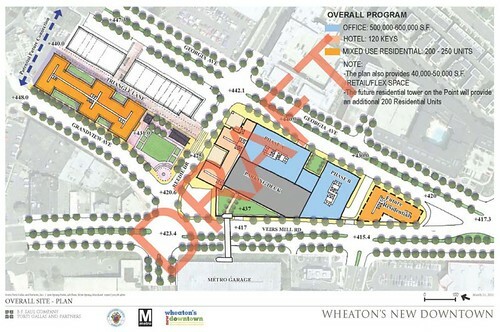 B.F. Saul's plan for downtown Wheaton. Most controversial was the $39.5 million price of building a platform over the Wheaton Metro station so B.F. Saul could build offices and a hotel on top. Noting that this was probably the most valuable site in the downtown, council economic analyst Jacob Sesker wondered why county should pay for it instead of the developer. "Unlike a school or a train, a platform does not teach any child to read and does not take anyone to work," Sesker wrote in this report. As an alternative, the council suggested spending $55 million for B.F. Saul to build a new headquarters for the Park and Planning Commission, a new town square and an underground parking garage on Parking Lot 13, located at Reedie Drive and Grandview Avenue and considered to be the "heart" of downtown Wheaton. In April, they voted to approve a "compromise" proposal, which also included funds to study building over the Metro station in the future. Not surprisingly, supporters of B.F. Saul's plan were upset. Blogger Wheaton Calling accused the council of "throwing a wrench" into the redevelopment process, while resident Henriot St. Gerard called the council's vote a "show of disrespect" to the community. It's likely that they're even more frustrated now that B.F. Saul walked away because they wanted a "larger parcel" for development. However, the fact remains that Wheaton doesn't have a market for offices, at least not right now. Not only is Leggett and B.F. Saul's emphasis on office development risky, but premature. The downtowns of Silver Spring and Bethesda were retail destinations and population centers before they became office hubs, and it's safe to assume that Wheaton will follow suit. Projects like the Exchange, a new building across from the Wheaton Metro station, are being built without public assistance. Besides, it's not like Wheaton isn't already attracting private investment. It just happens to be housing and shops. There are several residential and retail projects being built in or near downtown Wheaton right now without public funds. And in nearby Glenmont, arguably a more troubled area than Wheaton, developer JBG plans to build a massive mixed-use development without any subsidies. The Metro station is the most valuable site in downtown Wheaton and thus has the most potential for profit, but it's also the most complicated part of the entire redevelopment. We could use public funds to help B.F. Saul build unwanted office space there today. Or we can wait and instead focus on other, less complex development sites in downtown Wheaton, such as the county's five surface parking lots. Through a mix of policy incentives and limited subsidies, we can encourage the development of other uses on those properties, like government offices, housing, shops and restaurants, and even entertainment venues, as has been proposed before. This will generate tax revenue and build up Wheaton's reputation while creating demand for office space. And eventually, Wheaton will become such a desirable area that developers will want to build on top of the Metro station without government help. The loss of B.F. Saul is a blow to the revitalization of downtown Wheaton, but it says more about them than it does about Wheaton. Investment is happening here, and in the coming years, we'll see a flood of new residents and new businesses in the area. While Montgomery County can and should encourage more development here, they should be judicious about how and where public funds are used.